Is the Next Big Superfood Already Growing in Your Backyard? Everyone loves a good superfood. Kale, quinoa, acai berries, and pomegranate are all great yoga-fuel. But is the next big superfood already growing in your backyard? Quite possibly. Enter the pawpaw. Haven't heard of it? Neither had I. So imagine my surprise when I read about the largest fruit native to North America and it's numerous health benefits. North America only has a few native fruits: Concord grapes, cranberries, blueberries, and the pawpaw. However, the pawpaw has gone relatively overlooked, despite its history in the founding of the United States. One of George Washington's favorite desserts was chilled pawpaw, Thomas Jefferson planted pawpaw trees at his house, Monticello, and Lewis and Clark apparently survived on pawpaws while exploring the west when they ran out of food. But now the pawpaw is beginning to come back to prominence. 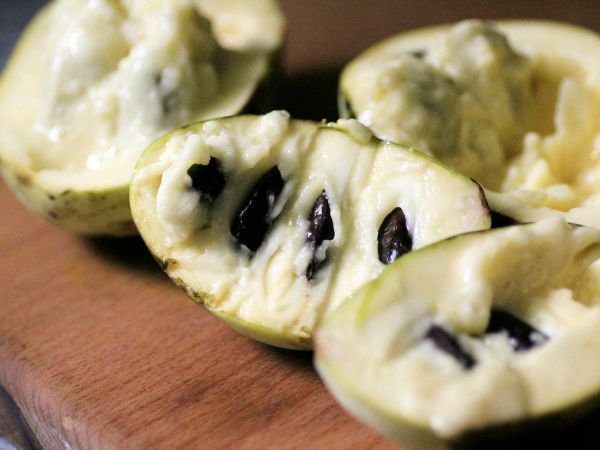 This "tropical" fruit is native to twenty-six states, and has crazy-awesome health benefits. The pawpaw has high levels of antioxidants (similar to cranberries), more Vitamin C than oranges, twenty times the magnesium and almost seventy times the iron of apples, bananas, and oranges. The bark of the pawpaw tree was studied by Purdue University, and they found that it is the strongest cancer-fighting plant in both North and South America. Over forty anti-cancer properties were found within the bark. The leaves are also a natural insecticide. Plus, apparently it tastes like a mix between a banana and a mango. What's not to love? The pawpaw has had difficulty finding a spot in the supermarket, because it needs to be eaten pretty quickly after being harvested. However, you can make a pretty tasty jam or ice cream out of the pawpaw fruit, which would help it keep longer. However, if you want some pawpaws of your very own, you're in luck! They're very popular among backyard gardeners, as they're easy to establish, and don't require any pesticides to thrive. How great is that? Check out your backyard or surrounding area for pawpaw trees. The next big superfood, and all of its benefits, might be closer than you think.